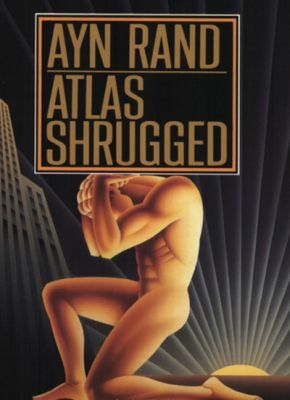 Atlas Shrugged is Ayn Rand’s magnum opus. Society where we are brought up determines our thought process and hence instills the foundations of rights and wrongs in our life. But there are people although very few in numbers who are not conditioned by the society. They have their own rules and dictate their life accordingly. They believe in doing their work and are not affected by what others have to say. And these are termed as ‘Prime Movers’. World cannot move ahead with prime movers yet it treats them cruelly. Reading Rand’s writings make one to go into soliloquy and question oneself about existence, ethics, mind, reasons, dilemmas and life as a whole. I experienced the same thing when I finished The Fountainhead and now Atlas Shrugged. For me her writings are not novels rather structured philosophy, digging deep into the role of mind in human life. Like Aristotle, she strongly hits the capitalistic society and the sodden egoism. Cynics who strongly reject convictions as dogmatism would not able to see its hidden beauty forget about surfacing the objectivity. She’s got the incredible knack of uplifting humankind and giving a stature of heroic version. One of the most beautifully spun book. Her prophetic prose of 1960’s has come to pass, where politicians became pawns at the hands of the crony capitalism. It’s not only happening in the US but in India as well. The book is not for light reading but strongly recommended for people who are not afraid of digging into their minds for pioneering a spirit of creative pathways to a productive future for generations to come.